Saturday we marched our out-of-town guests Michael and Ana down to the open house at New Deal Distillery. That's Tom, one of the founders, manning the bar. New Deal started up a few years ago with a mission of providing Portland with quality local vodka at an affordable price. At first they worked out of a cheap office in the ActiveSpace building at SE 9th and Main Street. At some point they moved across the street into more spacious digs, which gave them room for better equipment, more experimentation, and Saturday afternoon open houses (noon to 5 PM). It's been a while since I had New Deal's eponymous 80-proof vodka, and it was even nicer than I remember it -- perhaps a testament to the new equipment. It is distilled with a few secret botanicals to add a little aromatic flavor, but not enough to push it out of neutral vodka range. I'm not a spirits expert, but that was news to me: I always thought vodka was just pure distilled hooch with no fancy additives. Next time you need some vodka, buy local! It's good stuff. 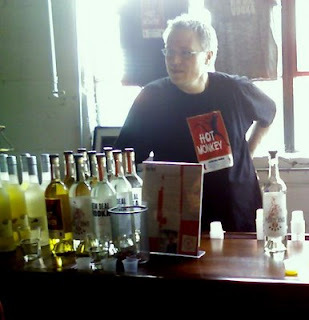 We also sampled their other wares: Portland 88, stronger and less aromatic than the flagship vodka; Hot Monkey, a pepper vodka made with five secret chiles; and a chocolate vodka that hasn't hit the store shelves yet. I didn't expect to like the chocolate vodka, and I didn't for a couple seconds, but it grew on me quickly. It wasn't half bad. The Hot Monkey was more to my liking. Carla and I argued over which pepper types are in it -- ancho was the flavor I picked up, but she claimed chipotle. More research is needed, so I bought a bottle to take home. Distilleries have taken off in that neighborhood in a big way. We wanted to make another stop at Integrity Spirits, but no one was there Saturday afternoon. Just a few blocks south on 7th is House Spirits, and distillers Sub Rosa and Artisan Spirits are somewhere nearby. New Deal is also producing a line of organically-grown liqueurs for a Bay Area company called Loft Liqueurs. We tried three of the Loft flavors: lavender, ginger, and lemongrass. Pretty fancy. I liked the ginger best, but I'm especially impressed at how good the lemongrass liqueur was. I love the flavor of lemongrass, but when I tried to infuse some into vodka a few years ago, it was a disaster -- an alarming chemical-solvent flavor was what I ended up with. Not so with Loft's lemongrass: its delicate herbal lemon flavor was right on. Certified organic and repels mosquitoes, should be a big seller. If you find yourself at the Lucky Lab or the Green Dragon some Saturday afternoon, walk over to New Deal and take advantage of the open house. I have a bottle of Integrity Absinthe, although I do enjoy several other brands I've had (Lucid, Le Tourment Vert, Absente) I absolutely cannot drink this one. I think it might be specific to my tastes, Debbie thought it was ok. I'm now wondering what to do with a ~$60 bottle of absinthe I can't drink..? Brett: I didn't know you were an absinthe guy. I love Integrity Absinthe. You added water, right? I think Integrity doesn't need sugar, but you could try a sugar cube if you haven't. If all else fails, send it my way :-). One of my friends, Matt Van Winkle, is the other founder. New Deal rocks. The Hot Monkey is a big fave of friends and mine. Funny story. When we were there a couple weeks ago, we were buying some bottles and were chatting about Hot Monkey with the woman there. She was talking about all the mixed drinks she's heard it used in, and I said, "Huh, mixed drinks? I hadn't thought of that." She literally did a double take, wheeling around in shock. Apparently not everyone drinks shots like we do. Jeff: Tom did give me a taste of the beer schnapps. I wonder what it would taste like at 90 proof instead of 180. That's exactly what I said! It was insane at that proof.